Undertaking an MBA programme is a significant decision to make. So when you understand that it is your real desire, try to research your choice of programme and business school as thoroughly as possible. In this post I will outline some of the facts which require attention, such as the international accreditation, continuous presence in both prestigious top 100 rankings, and national leadership. These facts may certainly influence your final decision, but they are not crucial. That is why I want to describe to you a couple of things which helped me to form my preference of MBA programme. The first one happened when I visited Smurfit Business School last year. The only thing I knew was that somewhere in Blackrock there was a university which offered a top MBA programme. There I met one member of admission team. During our conversation and a little excursion through the university building I got quite a distinct picture of the programme and of the School itself. There I could really feel the spirit of the School and was seriously impressed with their professional approach, which I could see in every little detail. So my first advice to individuals interested in an MBA programme is to go and see the campus, speak with people and ask questions. The second piece of advice I would offer relates to alumni of UCD MBA programme. In order to explore the School more deeply, I wrote to some graduates of last years class and asked them to express their opinions. They didn’t want to advertise UCD MBA programme, but they wanted to provide me with their knowledge and help me to make the right decision. The key is to find and write to current alumni, speak with them, and again, ask questions. Facebook and Linkedin are quite helpful in this case and I found alumni more than willing to assist.. In conclusion, I can say that these things really work and that I am reassured and absolutely happy with my programme choice. If some readers of this blog are curious about UCD Full-Time MBA programme, please, feel free to write to me and ask your questions! Orla Nugent talks about why the Smurfit MBA is such a success and what potential students should be looking for in an MBA programme. The UCD Michael Smurfit Graduate Business School Full-time MBA programme has been ranked 91st in the world and 25th in Europe, according to the prestigious 2014 Financial Times Top 100 Global Full-time MBA Rankings. It is the only Irish business school listed in the rankings, and one of less than 50 schools worldwide that have been consistently ranked in the top 100 over the past 15 years. “Our students are competing with graduates from the best schools in the world in an increasingly competitive international market,” said Professor Ciarán O hÓgartaigh, Dean, UCD Business School. As the only Irish business school listed in these rankings, the UCD Michael Smurfit Graduate Business School maintains its status as Ireland’s leading centre of excellence in business education. The school’s placement in these global rankings follows UCD Business School’s successful re-accreditation in 2013 with one of the world’s leading international accreditations for business schools – AACSB. UCD Business School is the only business school in Ireland, and one of less than 60 worldwide, to hold the ‘triple crown’ of accreditation from the three centres of business and academic excellence;EQUIS (Europe); AACSB (US); and AMBA (UK). Some good news this week, the UCD EMBA is now placed 81st in the Financial Times global rankings for 2013. The Irish Times picked up on the breaking news quickly – “The Dublin university, which is the only Irish business school included in the global rankings, has moved up seven places in the rankings from last year, up to 81.” Read more here. The Journal.ie ran with an article entitled “UCD Smurfit School MBA ranked among best in world” which in 24 hours has received almost 15,000 views. Click here to read. You can access the school’s own announcement on Business & Leadership by following the link for the associated press release here. A special thank you to all who participate in these rankings every year. Your efforts contribute to growing the UCD Smurfit MBA as the brand leader in Ireland. The prestigious EMBA programme gets widespread media coverage based on the recently announced inaugural Economist’s EMBA rankings. The Economist’s Executive MBA ranking places the UCD Smurfit School in the top 20 in Europe. This is the first Executive MBA ranking undertaken by the Economist and UCD Smurfit is yet again the only Irish business school to be included. In the Financial Times Global Masters in Finance ranking, the UCD Smurfit School is placed 34th this year, up one place from last year. “We are delighted to be recognised by two of the world’s leading independent rankings for our MSc in Finance and for our Executive MBA,” said Professor Ciarán O hÓgartaigh, Dean of Business, University College Dublin. “These rankings recognise our position as an international leader in business education and are a tribute to the great work that our faculty and staff put into the design and execution of our courses,” he said. To read more, please go here, and here and also here. UCD Smurfit Executive MBA ranked ranked 57 in the world. The UCD Smurfit Executive MBA has been ranked 57 in the world published on Friday 19th July by the Economist magazine. Once more, UCD Smurfit is the only Irish MBA to make it on to this type of global listing. According to The Economist, this inaugural EMBA ranking is based on criteria in two categories: personal development/educational experience and career development. The Economist plans to run this ranking every two years. The UCD Michael Smurfit Graduate Business School Full-time MBA programme has been ranked 64th in the world, according to the 2013 Financial Times Top 100 Global Full-time MBA Rankings, published today. The School was ranked 18th among the top MBAs in Europe. 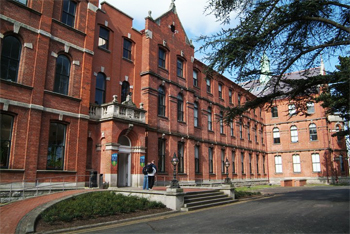 This is the fourteenth consecutive year that UCD Smurfit School has been included in the global top 100. The School is the only Irish business school listed in these prestigious rankings, maintaining its status as Ireland’s leading centre of excellence in business education. It is also among less than 50 schools worldwide that have been consistently ranked in the top 100 over the last fourteen years. The UCD Smurfit MBA’s placement in these global rankings follows UCD Smurfit’s successful re-accreditation in 2012 with one of the world’s leading international accreditations for business schools – AMBA. UCD Business School is the only business school in Ireland, and one of less than 60 worldwide, to hold the ‘triple crown’ of accreditation from the three centres of business and academic excellence; EQUIS (Europe); AACSB (US); and AMBA (UK). Congratulations to Cathal Brady who has won by the 2012 AMBA MBA Entrepreneurial Venture Award. His company, Ultan Technologies, develops software products for the utility industry. The UCD Smurfit EMBA graduate from 2004 won the award for demonstrating entrepreneurial motivation in his development of a sound and innovative concept and identifying a niche in the market that meets the needs of the business world. For more details please click here. A special word of congratulations also to Justin Thomas, FT MBA 2012, who was a finalist in the 2012 AMBA “Independent” MBA Student of the Year Award also presented on the night. Justin made an outstanding contribution to his class during the past academic year and we wish him well on his exchange programme to South Africa. – Michael McDonnell, Specialist MBA Programme Manager. The UCD Michael Smurfit Graduate School of Business MBA Programme continues to be ranked in the global top 100 MBA programmes. The latest Financial Times, FT, MBA rankings released last week currently ranks the programme 86th in the world and 20th in Europe. We are the only Irish Business School to be ranked. We are among less than 60 schools worldwide that have been consistently ranked in the top 100 over the last thirteen years. As we all know the MBA market is increasingly competitive. This is clearly demonstrated in the FT rankings which included some 6 new entrants and 7 re-entrants, underscoring that continual improvement is key. Our aim is to develop Global Minds and in order to achieve this we must continue to evolve. We evaluate our Academic Curriculum, Personal and Professional Development and Careers Programmes on a regular basis incorporating learning from our students and the market place. This demonstrates the School’s emphasis on continuous improvement and re-affirms the quality of a UCD Smurfit School qualification thereby strengthening the employability of all of our graduates. The Financial Times ranking of the top 100 global full-time MBA programmes was published today. The UCD Michael Smurfit Graduate Business School MBA has jumped 20 places in the global MBA rankings. We are now ranked as 78th in the world and among the top 25 MBAs in Europe. We are among less than 50 schools worldwide that have been consistently ranked in the top 100 over the last twelve years. We are the only Irish MBA programme that appears in the ranking and are pleased given these difficult economic times that we have improved our standing. So what’s behind this? We believe it’s a combination of continuous improvement; a collegiate leaning environment coupled with small class sizes, dedicated programme and academic teams and outstanding alumni. For example we are currently undergoing an academic review of our curriculum, the objective being to enhance student learning. We have streamlined our Personal and Professional Development Programme, which includes team development and individual business coaching with experienced professional business coaches. Finally our MBA Careers Service continues to work on a one to one basis with our MBA students providing them with the skills to accelerate their career. Stay posted for more updates.